our workspace is about 50 feet from our house while our office is inside the house, meaning that on any given day dave & i each walk back and forth at least 5-10 times, and never with less than 8 dogs following behind. actually i don’t know why i said following behind – no one follows behind – everyone likes to pretend they know exactly where we’re going and then when they realize they have no idea they stop dead so there’s always a split second where i fall, almost fall, or step on someone. the ones who stay put are the dogs that would tend to be walkers and would follow beside or behind us but they’re sensible and opt to stay put the whole day – they don’t make the journeys to and fro – they go to work and at the end of the workday they commute home, hence we end up traveling with a bunch of hooligans (oops i think i may have digressed). 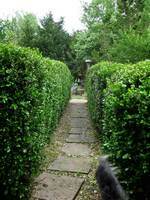 we have a row of hedges that is situated about halfway in between the workspace and house and walking by it is the best part of the journey. 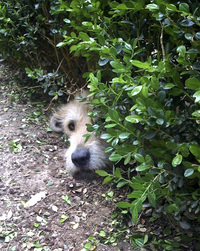 the dogs have dug a perfect hole for sleeping underneath the boxwoods and you will almost always find one dog or another languishing away. 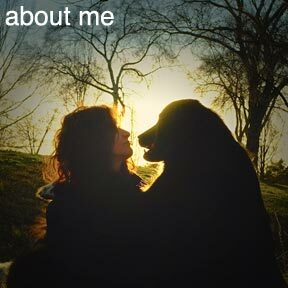 it’s perfectly situated so said dog is always abreast of where we are, after all it’s hard to miss us going by. every time i walk by i wish i had brought my camera with me, or more conveniently, one of my eyeballs had a camera implant (you have no idea how many times a day i wish one of my eyeballs had a camera in it - imagine never having to wish you had your camera again) and please don't say the memory is an eyeball camera because it just isn't. again i digress...the other day i was carrying my regular old boring camera and got a shot of fletch in the hedge. i've been corrected by dave - the workspace is 50 yards (not feet) from our house - whoopsy daisy!